Here’s the reality, everyone has sweaty feet-not just grooms standing at the altar on their wedding day as the old joke goes. You have a quarter of a million sweat glands per foot. Human feet sweat and can produce up to a pint of sweat on a normal day. Sweaty feet, not only can mean stinky feet, but if you have a fungal infection like athlete’sfoot or toenail fungus, you continue to have a breeding ground for fungus living inside your shoes. You can treat your fungal infection on your feet, but putting your feet back into your fungus-filled shoes can only mean one thing – you are destined for re-infection! What’s the solution? Should you throw out all of your favorite shoes? Not so fast. Before, the only solutions were messy powders and chemical sprays to treat your shoes. 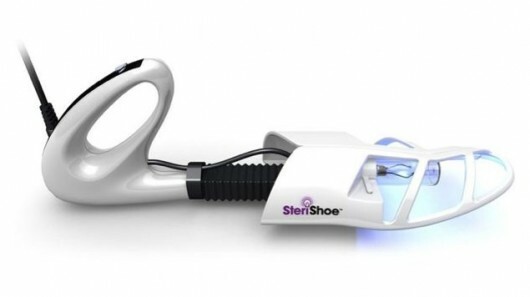 Now there is the SteriShoe® Sanitizer. The SteriShoe® Sanitzer is a device shaped like a shoe-tree that slips easily into your favorite pair of shoes. It is fitted with a special germicidal, ultraviolet light that kills 99.9% of the microbes that cause toenail fungus, athlete’s foot and offensive foot odor. You can treat your closet full of shoes with only one SteriShoe®. Treating your shoes is so easy – simply insert the SteriShoes®, plug the unit into an outlet and after 45 minutes you will have fungus-free shoes. SteriShoe® Sanitizers are guaranteed to cut down on athlete’s foot and toenail fungus re-infection and help people plagued with smelly feet. SteriShoe® Sanitizers are available at Kansas City Foot and Ankle. You don’t have to have an appointment to stop by and pick one up. Call us 816-943-1111 for more information and to get your SteriShoe® Sanitzer today.